Like the dime, the quarter dollar was not produced until 1796 and thus never bore the Flowing Hair design common to the earliest silver products of the United States Mint. The reason for this delay in coinage was likely that there were simply enough Spanish two-reales pieces in circulation that additional coins valued at 25 cents were not required. Such competition with the Spanish "two bits" restricted the minting of United States quarter dollars for decades and was not fully eliminated until all foreign coins were demonetized in 1857. The Draped Bust quarter dollar series consists of just five dates: 1796, 1804, 1805, 1806 and 1807. The first of these features Gilbert Stuart's portrait of Liberty paired with a reverse displaying a small eagle perched atop a cluster of clouds and encircled by a wreath of olive and palm branches. No statement of value is found on this first issue, as its reeded edge was too thin to permit the lettering employed with half dollars and silver dollars. After 1796, quarter dollar coinage was suspended for several years. When it resumed in 1804 the Small Eagle reverse was replaced with one depicting the Great Seal of the United States of America, this being known as the Heraldic Eagle reverse. The value "25 C." was added to the bottom of the reverse, a space not quite sufficient for a comfortable fit. 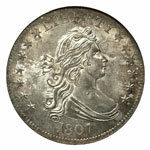 This type was discontinued after 1807, when quarter dollar production was again suspended for some eight years. 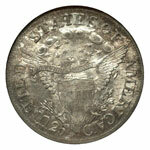 A mere 6,146 quarter dollars were produced of the 1796 issue having the Small Eagle reverse. Though a fair number were preserved in mint state or very close to it, the balance of the mintage seems to have circulated extensively. Examples grading Very Good through Extremely Fine are particularly scarce, and this accounts for the very high prices attached to this one-year-only type coin. The 1804 quarter dollar is by far scarcer in all grades, but its price is held in check due to the very small number of persons collecting these coins by date and variety. The type collector has the 1805-07 issues from which to chose, and these are all much more available and are of approximately equal rarity to one another. 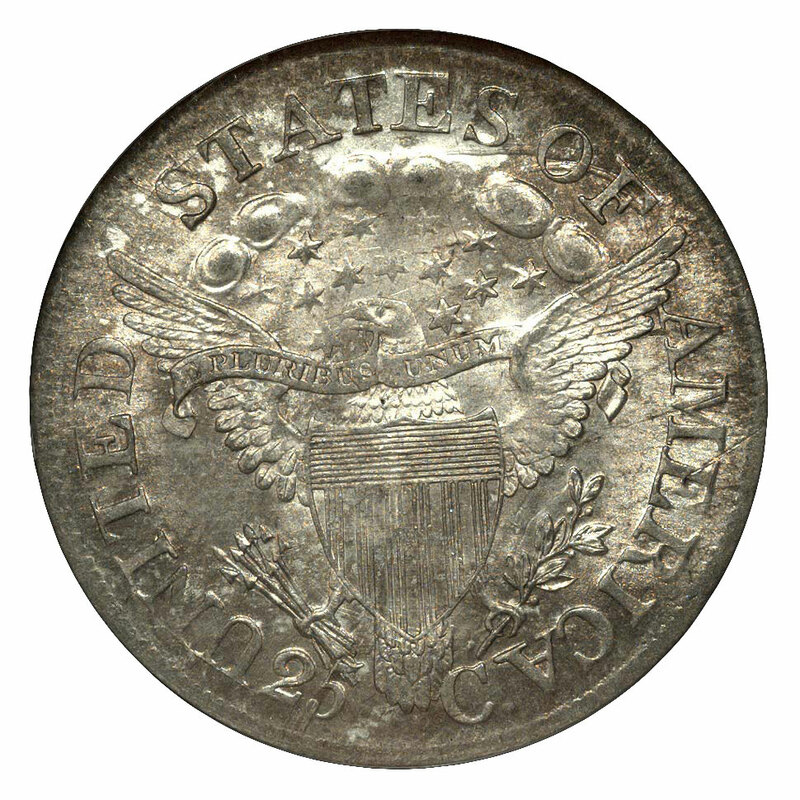 Though high grade examples of the 1796 quarter may reveal some weakness of strike in the eagle's head, this issue was generally well struck. Frequently seen are adjustment lines resulting from the planchet's faces being filed down to legal weight prior to striking. Unless they are very deep or in some way obscure the design, adjustment lines will have little effect on a coin's grade. A far greater problem for circulated 1796 quarters is that they seem to have attracted more than their share of mutilations. Finding an example that is free of scratches and edge bruises will be quite challenging. The Heraldic Eagle quarters of 1804-07 are likewise subject to such abuses, but their overall greater numbers have left us with a greater pool of coins from which to select desirable pieces. The 1806-dated quarters are slightly more common than the other dates, including the 1806/5 overdate variety. The quality of the U. S. Mint's products declined during the early years of the 19th Century, and well struck examples of the 1804-07 quarters are exceptional. 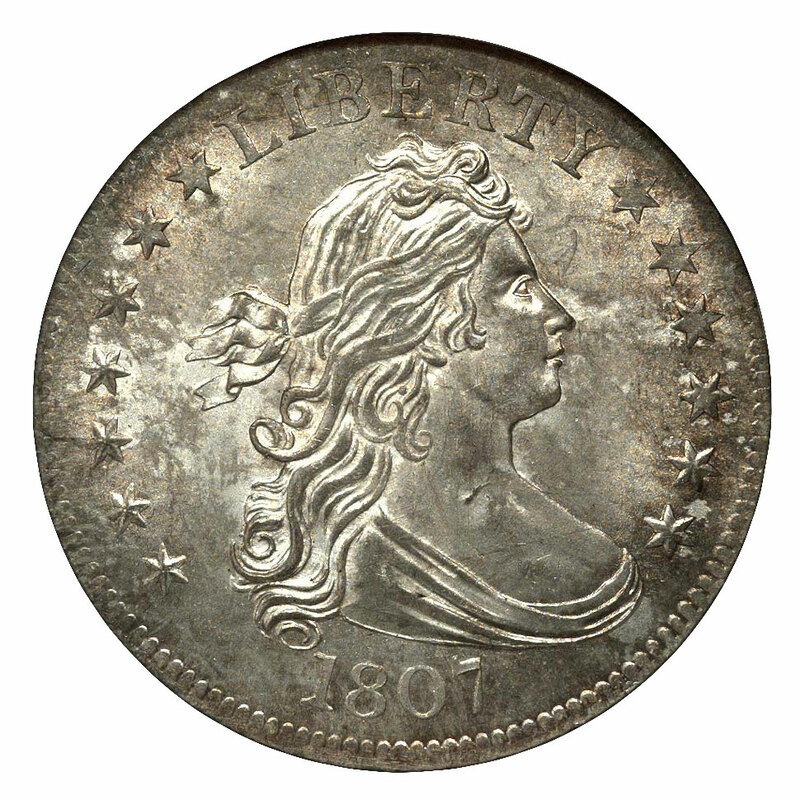 Both types of Draped Bust quarters were subject to uneven wear, due to their shallow rims. Being struck in an open collar, it was not possible to raise a rim of consistent height. Thus, these early quarters did not wear uniformly from the outside inward as on modern coins. The peripheral elements, such as stars and lettering, may be clear at one clock position and completely obliterated at another. Central weakness is due usually to poor metal displacement at the moment of striking or to sinking of the die from improper hardening during the die making process.